Please download a printable PDF of this information and post it wherever you think would be appropriate! 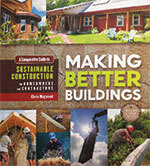 Chris Magwood of the Endeavour Center, Ontario, Canada, will present "10 Straw Bale Wall Systems." Chris has designed and built some of the most innovative and sustainable buildings in North America. 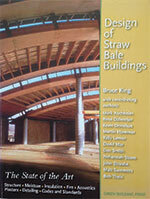 He is the author of several books, including Making Better Buildings, Straw Bale Details, and More Straw Bale Building. Chris's presentation will be on Saturday afternoon. Bruce King, P.E., is one of the founding members of CASBA. He is a structural engineer, founder of the Ecological Building Network, and has authored several books on sustanable building, including Buildings of Earth and Straw, Design of Straw Bale Buildings, and Making Better Concrete. Bruce will speak on Friday evening. Five slides in five minutes or 20 slides at 20 seconds each! These fun, fast-paced presentations are a great way to get to know a little bit about everyone at the conference. Every attendee is invited to bring either five or 20 images and tell the whole group about them in a few minutes. Social Time with other straw building enthusiasts!